WEC Group Joins Forces with SMP! 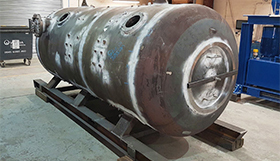 WEC Group has acquired a 50% stake in Preston-based commercial diving and hyperbaric product manufacturer Submarine Manufacturing & Products Ltd (SMP) to make both businesses stronger entities. The addition of SMP to WEC's ranks will provide a host of benefits to the company thanks to their wealth of complex products on offer, including diver decompression chambers, hyperbaric oxygen chambers, breathing air compressors, and commercial diving helmets amongst many others. Both WEC Group and the 40-strong SMP will gain access to each other's expertise and skills, thus strengthening operations further and facilitating both businesses' long term investment and growth strategies. With the joint venture taking the Group's overall staff headcount to around 680, WEC will combine its engineering expertise with SMP's to enable them to meet even the most demanding project requirements. Steve Hartley and Wayne Wild, respectively Managing Director and Group Commercial Director of WEC Group, have joined the board at SMP and will take an active role in the business to enable the new joint venture to realise its full potential. Steve Hartley commented: "SMP and WEC Group have had a longstanding business relationship and there is a very good strategic fit between the two businesses." "We are delighted to announce that the two companies have entered into a joint venture arrangement in which WEC Group will bring increased engineering and business expertise to SMP, paving the way to future growth and building on the foundations laid down by SMP over the last thirty years." "I have been a personal friend of the Managing Director of SMP Phil Connolly for over 14 years and I am excited at the prospects of what we can accomplish together". The new joint venture will enable both companies to achieve their high growth targets as well as opening the door to new opportunities. Phil Connolly, Managing Director of SMP commented: "This is fantastic and exciting news for both businesses. It will facilitate support in key areas and enable realisation of the excellent sales opportunities that exist in our market. We are looking forward to a bright and healthy future for our combined business."